I’m on location in Aspen for the Winter X Games, and I scored a first hands-on with it. In fact, if you add me on Periscope @brentrose you’ll be able to watch a first live-test of this as I snowboard down a mountain in Colorado and hopefully don’t die (starting around 8am PST / 11am EST). There are shots you can get with a GoPro that you just can’t get with your phone. You still have to have your phone with you and paired to your camera, but it can be tucked away somewhere safe while the camera goes through hell. Examples include keeping your phone safe in your pocket or backpack while you’re snowboarding with you GoPro mounted to your helmet (or, God forbid, selfie stick). Or keeping your phone safely tucked away in a dry bag while you kayak down a river. Hell, I’d stick my phone in a waterproof case, jam it down the back of my wetsuit, and go surfing with my GoPro mounted to the nose of my board. You get the idea. And even the best phone cameras don’t have optics anywhere near as good as those found on a GoPro. The image sensor is larger on a GoPro, and thus capable of gathering more light in dark situations. GoPros also feature a very wide 170-degree maximum field of view. That isn’t better for every situation, but for capturing landscapes and getting more action into the frame it’s far more immersive. Here’s how it works: You connect your camera to your phone via the GoPro app, as usual. Then you fire up the Periscope app, hit the start broadcast button, and it recognizes the connection to your camera. You’ll then see icons for either the phone or the GoPro, tap the one you want, and you’re off to internet fame and glory. In fact, you can toggle back and forth between the GoPro and your phone camera during your live broadcast for multiple angles, which is pretty slick. Video will come through the GoPro at 720p30, and yes, you’ll be able to save your video locally to the camera’s micro SD card as you broadcast. At launch it will only be working with the Hero4 Black or Silver cameras and only on the iPhone 5s, 6, and 6+ running iOS 8.2 or higher. This is a smart integration from both companies. 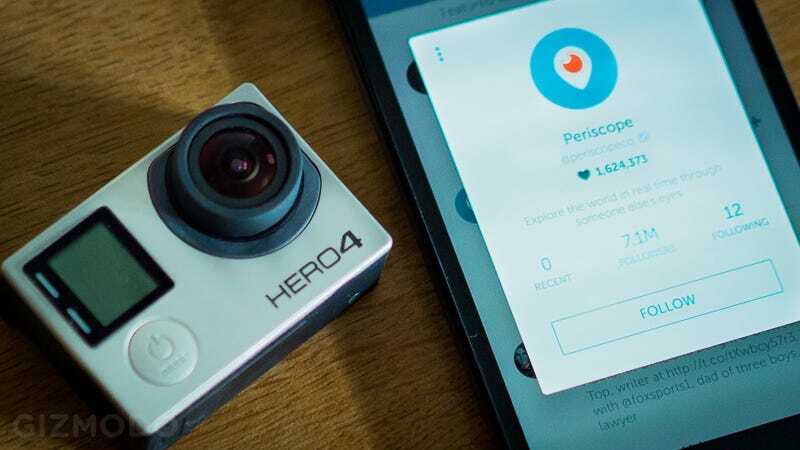 It incentivizes Periscope diehards to buy a GoPro to give them more ways to film, and for GoPro users, Periscope provides a new, live way to share adventure video. Meerkat offered something similar back in July of last year, but that was a very hacked-together solution, according to GoPro, and it was known to be pretty buggy. For this, GoPro and Periscope have been working together, so everything should run smoothly. Hopefully. We’ll see soon. This is the kind of thing I’d like to see being utilized by hockey and soccer players, mountain bikers, and skateboarders, but I could see Periscopers who aren’t into the whole sports thing using it, too, just for the better camera and additional angles. The one obvious downside is that when your phone is tucked away you won’t be able to see the questions and comments coming in from your audience. But if you’re reading comments while engaged in an action sport, you’re a danger to yourself and those around you. You can always check in and catch up when you’re back on the chairlift. This update will be rolling out today for iOS, and the Android version will hopefully be coming soon, though there’s no ETA for that yet. Again, I’m going to be demoing this starting around 8am PST / 11am EST on the first chair in Aspen, so follow me @brentrose and you’ll get an update when my broadcast goes live. I’m on a snowboard I’ve never tried before and may have set up incorrectly, so there should be plenty of carnage. You’re welcome, you sadists. Brent Rose is a freelance writer and longtime friend of Gizmodo, currently on a year-long road-trip around the US called Connected States. Follow him on Twitter, Instagram, Facebook, and ConnectedStates.com.